On Saturday, August 19, King Felipe and Queen Letizia visited Barcelona after the terror attacks in Barcelona and Cambrils on Thursday and Friday. Their Majesties visited Hospital del Mar and Hospital de la Santa Creu i Sant Pau, where victims on the Barcelona attacks had been brought in for care. In the afternoon, they lit candles and left flowers at Las Ramblas boulevard during a memorial for the 13 victims who lost their lives during the attack there. They also signed the Book of Condolence of the City of Barcelona. 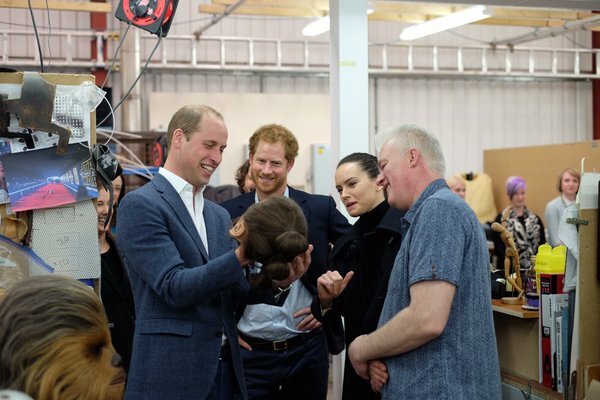 Switching gears… As we know, Prince William and Prince Harry visited the set of Star Wars at Pinewood Studios back in April 2016, it was an official engagement and there were photos of them on set. I guess people have been theorizing that the princes filmed a cameo appearance for Episode VIII, and they’ve asked John Boyega (Finn) about it. “Speaking on BBC Radio 4’s ‘Today’ program Friday morning to promote Kathryn Bigelow’s ‘Detroit,’ Boyega was asked about the rumors he fueled when last on the show – that the two royals had secret cameos in ‘The Last Jedi’ as stormtroopers – and whether the princes had lines. As Variety points out, Boyega saying he has to “dodge” questions of whether William and Harry were on set is stupid since their visit was an official engagement, there was press there, and KP released photos on them on set. Does Boyega being cagey about the princes’ visit mean they filmed a cameo for Episode VIII? 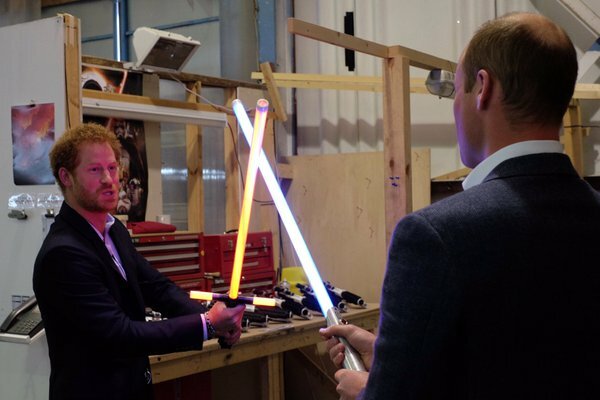 Does anyone care if William and Harry filmed a cameo for Episode VIII? On August 17, Crown Princess Mary opened the Odense Flower Festival, of which she’s been Patron since 2012. She attended the opening and named a new rose, which is named after the theme of this year’s festival: “What a Wonderful World”. Is it a thing to pour champagne over a plant to christen it? Wouldn’t the champagne damage the plant? I don’t get the secrecy surrounding whether William and Harry made a cameo. Supposedly they are stormtroopers in an elevator scene with Finn and Rey when they sneak onto an Emperial base. If they are stormtroopers, than the only ones who will know its them is William and Harry. So who cares? It is not a secret that will make more people go see the movie. It is all silly. I am jealous of them though for getting to be in Star Wars-another perk of their oh so difficult life. There is enough secrecy surrounding Star Wars, the Princes making a cameo is an unnecessary and inconsequential one. The secrecy isn’t necessarily William and Harry’s fault or doing. It’s the MO of the producer, JJ Abrams, on ALL his projects. He is extremely secretive about his projects to extent that his own cast may not know what’s going on until they see they finished product at the premiere. He uses that secrecy as a marketing tool for his projects by teasing about the content of his films and that way build anticipation for them. It’s a headache for studio marketing depts because they want to be able to build a traditional marketing strategy for his films, but i guess since he has rarely failed, he is able to dictate his preferred terms for his films. I didn’t say the secrecy was William and Harry’s doing. I know Abram’s likes secrecy-I work in the film industry!. But in Star Wars case it is also the studio, Disney, that is shrouding Star Wars in secrecy. I was saying it is a silly secret to keep regardless of who is pushing to keep it. KMR asked who cares? I care. I hate celebrities getting cameos in popular culture. I didn’t like seeing Ed Sheehan in GoT, and I don’t want the two princes in SW. It pulls me out of the story and makes me focus on the celebrity, however briefly. It doesn’t matter if we don’t see their faces, we already know they are there, like Daniel Craig in Episode 7. These slackers have so much already, and they want SW too? Ugh. I agree that when you can see the cameo and it’s a celeb who is just randomly there and not adding to the story in any real way, then absolutely it takes you out of the story (Ed Sheeran definitely was a terrible cameo). But “secret” cameos where you can’t actually see the celeb, like the ones in Episode VII I don’t think are distracting since you cannot see that it is a celeb. I hated Ed Sheeran in Game of Thrones. It was so jarring and unnecessary. I think William and Harry were on set purely for their own enjoyment and I would be tremendously surprised to see them in the film. That said, I think John Boyega was trying to make a joke. Obviously, he would know whether or not two members of Britain’s Royal Family had cameos in the final product, and it seems this is his polite way of saying the rumour is bullocks. I’m editing my comment after reading the above to include the following: what Overit said. I won’t forget when William said that thing to Daisy Ridley about the mask being an improvement over the real Daisy, or something along those lines. What a nasty thing to say about someone, especially because Daisy is gorgeous. Lots of people get SW cameos but why should W&H? She looked pretty upset, if you ask me, before laughing. The look on her face. But like everything with William they laugh even if they are being mocked. Nobody tells the guy no, that’s not kind or funny. Like when William standing next to Harry talks about how dumb his brother is. I think William’s humor is basically ‘let’s make fun of other people for my benefit,’, which isn’t nice. Stuff he has said to people has been pretty awful. I’m with Ellie, I thought that “joke” was pretty mean and not funny at all. I’d be very taken aback and hurt if someone I’d just met said something along those lines to or about me. I’m not sure I’d call William’s sense of humor dry either. Most of the jokes I’ve read he’s made in public have been a bit mean and at someone else’s expense. In recent years it’s often Kate or George who bear the brunt but Harry has served as the target as have celebrities like DR. I think he also sometimes uses humor to attempt to cover his lack of preparation for an event. In those cases his humor may be self-deprecating but better he just prepare! Daisy was momentarily taken aback before she laughed it off. Harry’s face was also momentarily frozen before he turned away. This was one occassion where William’s joke fell flat and offended, but because of the circumstances, not to mention the power imbalance even though William isn’t her boss and was merely a guest, she laughed it off, but the split second freeze from her AND Harry says it all. That type of humor is best for family and friends. That way they know your sense of humor and get that it’s a joke. William tries to be funny but it always falls flat to me. I think it always depends on the spirit in which it is said, he seems to be trying to be get a laugh, but it was at her expense and he’s just dreadful at it. Harry knows full well he is socially unintelligent. He could have said, oh this mask is marvellously realistic but still doesn’t do you justice, Daisy. Easy. I couldn’t quite hear the exact comment from William, but I think Daisy took it up and extrapolated it because she’s socially adept and I think it took a few moments for her to realise, after she’d been socially polite, that he’d just been rather rude. You mean William? Harry didn’t say that thing to Daisy, William did. But william can do no wrong in his own mind. Everyoen laughs and thinks he’s so funny when he’s cruel to people. Yes, sorry, William said it. I meant to say Harry seems fully aware William is prone to ‘social gaffes’ judging by his micro expressions quickly followed by a guarded neutral expressions. Harry literally face palmed this time. I wouldn’t mind to see Tom Hardy at such an event*giggles like a little school-girl*. He seems to be a funny man. I don’t know if it would be acceptable for the British Royals if William would play in such a movie.I suppose there are different rules for William than Harry? It would be interesting to know. I don’t like that Boyega doesn’t just say if they play or not.It seems he doesn’t want to spoil the extra attention for this movie.I know such cameos, they are always terrible short and forgettable, but you have a great name on your list. Flower Shows are nice events. To the name “What a Wonderful World”, I must be cynical, it seems some people today live in their own little world.How you could you name a flower show like this today? It is sad that Felipe and Letizia have to go to such a tragic visit, it’s sad that it is necessary.But I’m glad that they do, of course and I’m also glad that there are people who survived it, not forgetting thoses who died in this senseless act.Like someone wrote in another post, we are all in this danger today, which is a horrible feeling. is the champagne from Prince Henrik’s vineyard perhaps? I am also deeply unsettled by this use/waste of champagne. Just horrific really, when you think of those less fortunate. Like me. Who at this very moment is champagne-less. I think Boyega is being coy to keep interest up in the story. It’s a way to tease fans of both royals and Star Wars and keep them interested in the project. I don’t really care if they are. I’m one of those folks that was annoyed with Ed Sheeran being in Game of Thrones – it distracts from the narrative which is a piece of art in it’s own right. Agreed. Commented the same thing above before I read down here. Cameos can ruin a film unless done overtly for impact, like the Muppets films or putting the original actor in a reboot. I just snorted and got coffee up my nose. Nailed it! I just love Felipe and Letiza! Vic and Letiza have to be my favorite royal women. I love the picture of them in the hospital. Err what are those ginormous egg like things in the flower pic?!? Maybe the champagne on flowers is like christening a boat? Seems like a waste. I would think the sugar content in the champagne (can cause fungal/bacterial growth) would do damage to the plant but maybe since it’s Just a glass? Actors can pay for it–skipping security, passport control, even be driven to their plane… Hell, anyone can pay, if you have the money. At Heathrow it’s called Heathrow VIP or something. Every airport has it. Has nothing to do with Harry. Check out MMR for more. Evidently, Harry refused the costly VIP service/lounge and used rank to meet her directly on the tarmac. I know you can pay for that, too. But not surprised, these people–all royals, and I also include people like celebrities n this as well–do anything they want and nobody says no! I agree. My quibble is that we never get photos of her. That’s the only way I feel connected to any of the royals, or their possible partners. The only thing I can think of that is really stupid about a William and Harry secret cameo in Star Wars is that they complain about wanting to be seen as more than just celebrities, yet they are willing to do a cameo in Star Wars like any other celebrity. Bit hypocritical in that way. We will never know how these two think.It’s a strange logic.They want to be like everybody else, just like Diana wanted to teach them, and than they have fun on sets for famous movies. How do they think those two things could be a great combination? I doesn’t make sense at all. This wouldn’t be the first time that the Princes would rather have believe what they say, not what they do. I started to cry when I saw the pictures of the Spanish Royal Couple meeting the patients at the hospital. How kind and concerned they were toward all. And, the happiness of the faces of those they visited said so much. What a horror those people went through. Knowing that the Royal Family cares must have been very healing to all. I also liked Leti sitting at the table and writing in the condolence book. She gave me the impression she was writing more than her name. She seemed to really be expressing herself. I could be wrong. If so, how wonderful that she, as well as her husband, were bale to write their messages to those who suffered. I am always surpirsed when Kate does not seem to be permitted to do so.